Are you ready for some football?! From the same guy who wrote Hoosiers and Rudy, My All American is another rah-rah sports film based on a true story. This one is about Freddie Steinmark, who overcame great adversity to follow his dreams, and, well, you know the drill. Finn Wittrock, taking lead for the first time after supporting roles in films like Unbroken and going completely bonkers on American Horror Story: Freak Show, plays the All-American Steinmark. If you find yourself reading Editor-In-Chief John Teti’s weekly Block & Tackle column and wondering what this whole football craze is about, you may want to check out this movie. My All American hits theaters on November 13, but The A.V. Club and Clarius Entertainment have an opportunity for you to see it for free on November 9. For your chance to win a pair of passes to the advance screening, simply follow the link here and enter your information. Remember: Advance screenings are often intentionally overbooked, so be sure to arrive early if you want to guarantee yourself a seat. An official plot synopsis and trailer for the film can be found below. What Freddie Steinmark (Finn Wittrock) wants most in the world is to play football. 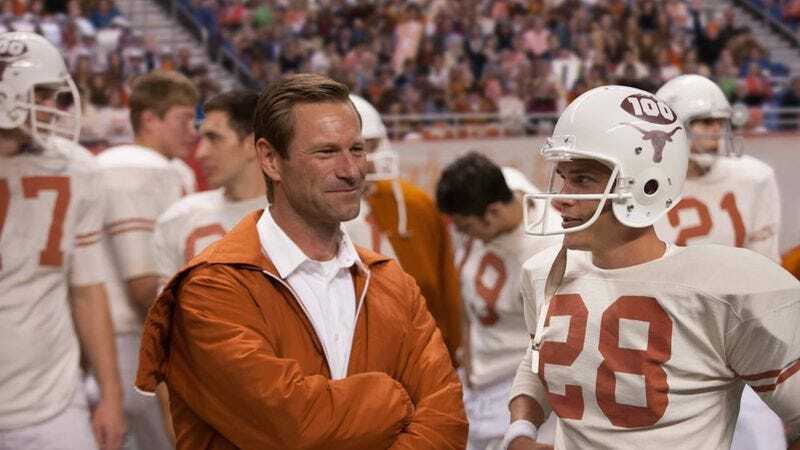 Deemed too small by the usual athletic standards, his father trains him hard, and Freddie brings a fight to the game that ultimately gets him noticed—by none other than legendary University of Texas coach Darrell Royal (Aaron Eckhart). Awarded a scholarship and a chance to play for the Longhorns, Freddie sets off to Austin with his loving high school sweetheart Linda (Sarah Bolger), determined to make the team. Alongside his old teammate Bobby Mitchell (Rett Terrell) and new pal James Street (Juston Street), Freddie is put through the paces of a grueling practice schedule, but the boys’ camaraderie off the field translates into solid playing on it, and they rise up the depth charts, giving the Longhorns a real chance to turn the team around. But just when they’re reveling in the success of the season, Freddie suffers an injury that leads to a shocking diagnosis and the biggest challenge he will ever face. From the writer of Hoosiers and Rudy, My All American tells the true story of a boy who became a hero and what it truly means to have the heart of a champion.